A family-run restaurant specialising in Malaysian, Thai and Sri Lankan dishes freshly prepared from authentic and original recipes using natural, traditional herbs and spices from the four corners of the world. Highly recommended by its regular clientele for the quality and value for money menu and the friendly welcome. Outside catering for all occasions and take-away with free local delivery. Occasional jazz evenings – check with restaurant. For takeaways, home delivery, birthday parties, weddings and all your indoor and outdoor catering needs. Occasional jazz venues in the restaurant. Open every day 6pm-11.30pm. All major credit cards accepted. No service charge. 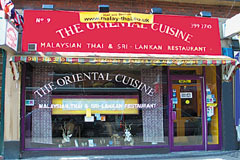 Authentic Malaysian, Thai and Sri Lankan cuisine. The Portuguese, Dutch, Malays, Arabs and South Indians who visited the Island either as traders or voyagers have influenced Sri Lankan food to an extent. Rice and Curry - boiled rice with curried vegetable, fish and/or meat laced with Sri Lankan spices is the typical Sri Lankan main meal, a gourmet�s delight. Boiled or steamed rice with a variety of curries, salads, sambols, pappadam and chutney form the meal. Spices are added to make the dishes more delectable. Curries are usually made hot but can be mellowed to suit the pallet. For those that prefer something lighter dishes such as hoppers, string hoppers and roti are eaten with curries for dinner.